Land and wildlife management is rapidly evolving and reaching new heights in popularity, due in part to the vast amounts of available information and the abundance of success stories. As hunters and land managers, /your-obsession/land-management we love to consume information on how to improve the properties we manage – from food plot strategies to prescribed burning to harvest criteria. But one often-overlooked aspect of an effective management plan is the importance of an efficient access system of roads, trails, and bridges. This part of the job is called bridge property management. Bridges are a critical component because creeks, canals, swamps and ditches can make portions of a property inaccessible to people or the equipment needed to improve the habitat. How can we effectively manage a property if we can’t access large portions of it? Planting and maintaining food plots, mowing, timber stand improvement, prescribed burning – nearly all habitat improvement measures periodically require access for people and equipment. A well-planned access system must take into account several design considerations and environmental factors, and offers many advantages both, to land managers and to the game we manage. There are numerous factors to consider when positioning roads and bridges on a property – and each property has its own challenges and opportunities. Topography, climate, land use, and your management goals are among the most important elements to take into consideration. After assessing your needs and defining your management goals, topography is a good place to start when designing a new access plan. You can acquire topographic data on nearly any property through a variety of digital sources or by using the U.S. Geological Survey quadrangle maps. Of course, there is still no substitute for spending time riding and walking the property. Topographic features often constrain the location of a new road, but can also offer opportunities. If the property has substantial elevation changes, try to work with the lay of the land, rather than imposing a rigid, grid-like layout. prescribed burn. Roads and bridges are the “arteries” of your property. management professionals must take all of these factors into consideration at the same time. Prevailing winds become an important factor if a road or trail will be used for hunting access into an area. For instance, if fall and winter winds are primarily out of the north this makes it advantageous to plan your approach to a food plot or other hunting area from the south, so as not to disrupt the area with scent on your way in and out. Keep in mind other key habitat features (e.g. travel corridors and bedding areas) and work to create an access plan that will keep you downwind of these areas during hunting season. 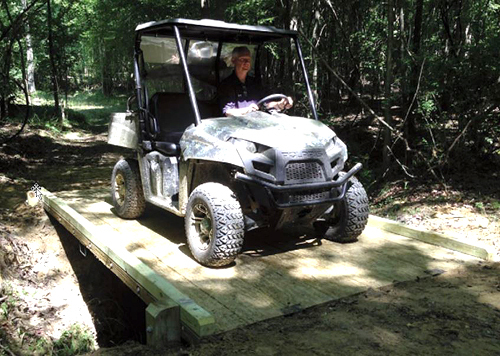 Roads and trails are often designed to connect two or more elements, such as an entry point into the property, a wildlife opening, a hunting location, or an existing bridge or suitable bridge location. Don’t make the mistake of assuming that a straight line is the best way of connecting two areas just because it is the shortest distance. Take topography, environmental conditions, and the existing elements of your property into account before finalizing a new route. Bridges are extremely important in realizing all of the possibilities of some properties. If a tract cannot be accessed what good does it do you? Bridges have their own set of requirements and factors to consider. Once a bridge is in place, it is a relatively permanent structure and becomes a fixed point that influences other parts of an access plan, so it is wise to carefully determine the best location. Creeks, ditches, canals, and small rivers vary drastically but there are some guidelines that hold true in most situations. It is generally best to avoid installing a bridge near sharp turns and bends in a creek. The banks are often more unstable in a creek bend due to the cutting action of moving water. Over time, the eroding banks cause creek bends to be the widest spans of a creek. The wider spans drive up the cost of the bridge, while the eroding banks can cause structural problems and shorten the lifespan of the bridge. Try to identify a relatively straight, stable stretch of creek for a bridge location. It is also important to consider the approach to the bridge and how accessible a potential bridge site is from other portions of the property. 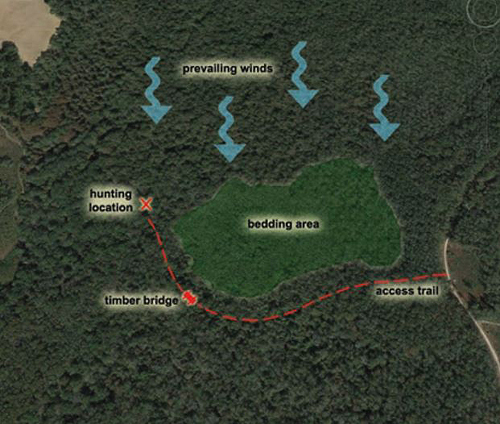 Is the location isolated by wetlands, steep ridges, or other drainage features that will restrict access to the bridge? How are the ground conditions on either side of the creek? Soft or unstable soil conditions may limit the type of bridge that is feasible, as well as the types of equipment that can access the bridge. Be mindful of your objectives when deciding upon a new bridge location to ensure that you maximize the benefits to your management plan. There are many options for bridge designs, materials, and construction. Different combinations of designs and materials serve to accommodate different needs and different budgets. The proper bridge for your situation depends primarily on the length of the span and the maximum load you intend for the bridge to safely withstand. Always remember that, regardless of material or size, bridges should be designed by an engineer or other qualified person. While steel and concrete bridges are a possibility, timber bridges accommodate the needs of most land and wildlife managers and offer many advantages. Timber is a versatile material and allows for abundant options for bridge designs. Whether the goal is a simple span to accommodate foot traffic or a complex structure capable of carrying heavy equipment, wood can be configured to meet either need. In addition to traditional lumber and beams, there is an abundance of engineered wood products on the market today that have broadened the capabilities of timber bridges. Wood is generally a cost-effective option as compared to other materials and it’s also a renewable resource. It is a natural fit to use bridging as an opportunity to support the forest products industry, since timber is a valuable natural resource and a key component of integrated land and wildlife management. hunt your favorite stand site. In addition to the benefit of using a renewable resource, wooden bridges offer other advantages that make them an environmentally responsible decision. In many locations, a permit is required to construct a bridge, and regulators often prefer timber bridges for several reasons. In general, there will be less disruption to the stream banks for the construction of a timber bridge than for other materials. In many cases, a timber bridge can rest directly on the soil of the creek bank. This eliminates the need to excavate and construct a concrete bearing or other permanent structure for the ends of the bridge. Limiting the amount of disturbance along the banks means less chance for sediment to enter the waterway and also reduces the potential for erosion problems to develop beneath the bridge in the future. Many land managers are attracted to culverts as an alternative to a bridge. From an ecological perspective, they are generally more disruptive to the flow of the waterway and can have a negative impact on the ecosystem by creating a barrier during low water situations. Culverts often require periodic maintenance and may not be a practical long-term solution. Creek crossings with culverts wash out easily during storms, when the water is high and moving swiftly. The upstream end of a culvert is susceptible to blockage. This occurs either from limbs and debris that become trapped, or from beavers, which have a propensity for identifying easy locations to build a dam. This blockage further increases the likelihood of a wash out when water is unable to pass through and begins to swirl and erode the crossing. A bridge minimizes these issues by not restricting the volume of water the creek channel can carry. Minimizing the effects of a bridge on the waterway should always be a goal; and another important factor that is both practical and environmentally responsible is the use of a clear-span bridge design. In other words, when possible, it is best to use a bridge that spans from bank to bank with no posts or piles driven into the streambed. Bridge piles alter the flow of water, potentially causing the streambed and banks to erode and lose stability. These structures also tend to trap logs, limbs, and other debris, which creates a maintenance issue and can eventually compromise the integrity of the structure if left unaddressed. Don’t neglect to consider potential maintenance as part of the equation when planning your bridge design. A clear-span design may not be practical, depending on the length of the span and the intended weight capacity of the bridge, but the use of a clear-span bridge when possible yields many long-term benefits. Consider the following scenario from a buyer’s perspective: a 320-acre tract fulfills all of the buyer’s criteria for a potential property to purchase. However, a large creek that crosses the north and west property lines isolates approximately sixty acres. With no bridge in place, this creek effectively eliminates almost 20 percent of the opportunity for habitat improvements and will likely restrict hunting and other recreational activities. A bridge reclaims this otherwise lost opportunity and instantly makes the property more desirable to the buyer. Keep in mind that a water source is a critical habitat component and an invaluable asset to your property. However, your water source becomes a “double-edged sword” in regards to property value if your access system does not address it. Try to avoid the error of allowing one of your property’s most valuable assets to restrict your habitat improvements, recreational use, and economic value. Aside from the economic value that quality roads and bridges add to a property, there is a wealth of recreational value as well. As I’ve already described, roads and trails can be designed in a manner that makes them more than just a tool for improving habitat – they can actually be a valuable component of the habitat. This – along with the other habitat improvements that a good access system facilitates – ultimately results in a property that will grow and hold bigger bucks, sustain more turkeys and game birds, or attract more waterfowl. Investing in access improvements can pay big dividends during hunting season. 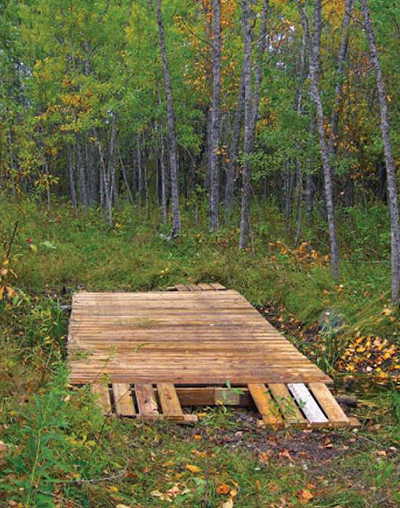 A well-designed trail or bridge can save a lot of time when you’re placing trail cameras, putting up deer stands, or making your way to a gobbling turkey at daylight. Remember, there is no magic formula for accomplishing a successful access plan. Every property is different, with unique challenges and opportunities. These suggestions by no means present a comprehensive list of the elements to be considered. It is difficult to achieve every benefit I’ve mentioned in any given road or bridge. The objective is to combine all of these factors and create a solution that offers the most benefits. To put it simply, think through these issues before you begin construction. The best management plans are detail oriented and intentional – and an access plan is no different. Whether you are a professional land and wildlife manager responsible for thousands of acres or you’re managing a small property with spare time and limited resources, we all share a passion for the art and science of wildlife management. A passion for conserving natural resourcesand improving habitats. A passion for healthier wildlife populations. And a passion for the long days full of dirt and sweat that are necessary to achieve success. A quality access system can help you break through the barriers on your property and take your management – and your results – to the next level.